At the moment there is a series being shown on our (nearly) local PBS television station WGBH, and possibly your local PBS station as well, highlighting the birth of the USA's National Park system. For many in our country, including myself, we have long taken for granted the beauty all of these various National Parks give to us. I say 'taken for granted' because watching the new series by filmmaker Ken Burns called The National Parks: America's Best Idea, I have been reminded of the great vision and frequent struggle it took to secure vast areas of beautiful land for generations of visitors to experience and explore. The series covers some of the efforts that went into securing some of the Parks for the national good, the creation of the Park Rangers, and even some personal stories from our ancestors before us. It is really a beautiful story to be told and very very interesting - apparently taking Mr Burns 6 years to make. And, as I learned from watching one series about President Roosevelt's efforts in relation to the National Park system, there is a now meaningful saying engraved into stone at the top of the gate that marks the North Entrance to Yellowstone: FOR THE BENEFIT AND ENJOYMENT OF THE PEOPLE. It is reassuring to know that there are many unsung heroes and heroines in our nation's history that played significant roles in protecting some stunning and inspiring locations so that they would never be harmed by the direct effects of mankind. Because of their efforts, we now have places as diverse as Acadia to Yellowstone and Yosemite - from the Grand Canyon, to the Everglades in the south, and to the Gates of the Arctic in the far north. There are now 58 National Parks in the USA - and the story of their preservation not only stretches back into 2 centuries now, but from watching the series on television - it is also insightful. I've visited some of the Parks in my travels around the USA, but not all of them, as some people can declare. In fact, we are talking about trying to arrange a visit to the Grand Canyon with the kids..... my husband wants to travel down the Colorado river. The National Park system is truly a proud gem in our country - something to be proud of. I'd be happy to hear any special stories you might like to share from your memories of travel to any of the National Parks. But, if you can, I suggest you try and watch the series. Watching it as it slowly unfurls on the screen also has a very calming effect on you after a long hard day. And, because it is PBS you don't have to deal with any ads screaming at you! Even if you can't watch the series, you should try and buy the series on DVD. I'd like to do that to show my kids at a more reasonable hour since the series comes on after bed time! My sister has been going on some amazing yoga trips lately, she just got back from one in Colorado so I asked her to write a blog about it. I would like to add that she is at a very different point in her life than me and probably many of you if you are reading my blog, she just sent her youngest daughter off to college! As you can imagine we are a big help to each other because we are so different, right now she is yoga tripping her way across the country! Finding herself after raising her kids (oh that sounds so trite but you know what I mean! ), I am so happy for her taking this time to herself, and at the same time, with each trip I can't help but yell out "I wanna go!!!" I hope this is an inspiration to you as much as it is for me! I’ve always been curious about these mystical practices and decided to investigate (especially easy to do after dropping off my “baby” at the University of Colorado in Boulder for her freshman year a few weeks earlier). Every year, there is a yoga conference at the surprisingly beautiful YMCA camp in Estes Park Colorado. This year the headliner was a yogi, TKV Desikachar. His father was the one who taught Iyengar, and many other of the famous teachers of today. He was a very humble and unpretentious man known for his healing techniques and was sharing them with us. All his stories of healing had the same message, chanting and meditation. It didn’t matter what your beliefs were, whether Hindu Gods, Christian, Jewish, etc, it didn’t matter. Asking for the healing power in the form of chants or mantras repeatedly and meditation, breathing can heal anything. After chanting with Mr. Desikachar and his wife for maybe 45 minutes and then some breathing exercises for about 15 minutes, I was amazed with the vibrational energy felt from the top of my head to the tips of my fingers and toes. I think the whole room was stunned by this phenomenon. What is also amazing is that I can get this heightened energy even at home when I am practicing and not in the presence of a great guru. Clearly, there is something to this. T.K.V. Desikachar is a world-renowned yoga teacher and the son of the legendary T. Krishnamacharya, who is known for revolutionizing the modern practice of yoga. 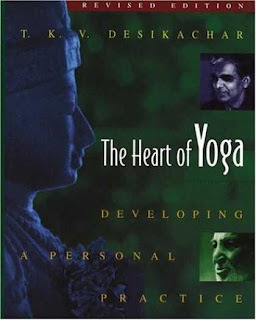 Like his father, Desikachar's teaching is characterized by a personalized, one-on-one approach that modifies a wide variety of yoga techniques to meet the different healing needs of each individual. 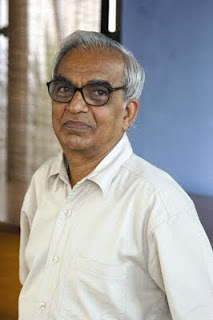 Desikachar has been a leader in yoga therapy for more than 30 years and is founder of the Krishnamacharya Yoga Mandiram in Chennai, India, and cofounder, with his son Kausthub, of the Krishnamacharya Healing Yoga Foundation (KHYF). Thank you Linda for sharing your experience! Ladies afternoon at nonchalant mom! of course our super selection of kids clothing! Please come and enjoy some healthy snacks and sangria! I am really excited to introduce a new collection on Nonchalant Mom, it's called Tola Layla. This beautiful collection is created by Alayne Patrick (who's home was also in Domino Magazine a while back and a huge inspiration for me!). Her store in Boerum Hill, Brooklyn is stocked with the most exquisite items that will turn your home in to a place of color and luxury. 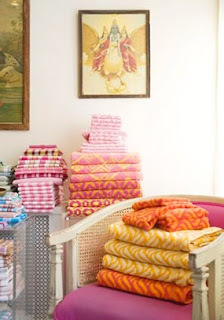 She has everything from waffle towels, that are really my favorite, to a beautiful selection of pillows that will transform any room into an palace! (but believe me it also looks good even in our little Rhode Island home!). Alayne often works with master craftsmen to create her selection of often one of a kind jewelry, housewares , clothing and bedding - the result is beautiful luxury. 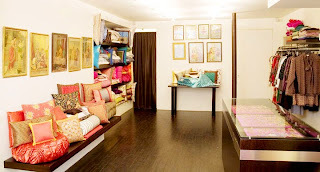 Her store is filled with an artfully curated mix of items for the home and body. Her clothing collection, which Alayne started in 2007, is filled with amazing hand block prints on soft cotton and silk fabrics. I feel that her look is casual-chic and inspires me to be more creative and I feel that her well-travelled self is evident in every piece. I love to start with her pieces and then pile on some jewelry and for the fall it's wonderful to add a giant colorful scarf. But do with it what you will, it is always going to look great! I think that Alayne has an amazing eye for detail, she is always concerned about comfort (when she is showing her collection she frequently peppers the conversation with talk of the comfort and ease of a piece) and I must say that she is the best model for Layla (she is beautiful!)! Thank you Alayne for sharing Tola Layla with us! and I hope you love her things as much as I do! I am sure that you are feeling the change in seasons in your eating habits, I know I have... somehow healthy food just sounds better now, after a summer of hot dogs and junk. It's a good time to stop eating sugar, move to more whole cooked-whole foods diet, and eat less! 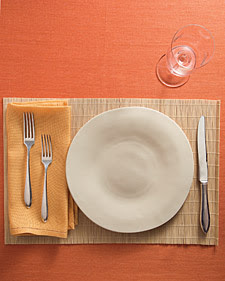 I think that many Americans feel that sitting down to dinner means looking at a full plate of food, but is this really necessary? NO! I don't care if you are overweight or not but a healthy portion of food is much less that you may think! For instance, I found these great suggestions in a recent issue of Martha Stewart's Everyday Food. They suggest, for an adult of average build, a serving of protein should be the size of a deck of cards, a portion of starch should be the size of a tennis ball and veggies are fare game and you can eat as much as you wish! (I would suggest that this doesn't count if it's 'creamed' spinach we are talking about... but you know what I mean!). The American diet has somehow morphed into a big plate of food and if you look at the suggestions above on a regular dinner plate it's pretty sparse. In our home I like to dish up everyones plate and then serve dinner, this way seconds are after the full range of food has been finished. We also happen to eat off of small plates which helps so that it doesn't look like tiny portions. Also important is eating slowly, in Macrobiotics it's important to chew your food, in fact, if you chew brown rice about 100 times you will find that the flavor enhances and changes throughout this process. Obviously it would be crazy to sit down and chew 100 times ALL the time but it would be optimal! and your kids watch you so if you eat fast and devour your plate... guess what... they will learn those same eating habits! Sit down, SLOW DOWN and talk at your evening dinner. We have borrowed an idea from Blair at Wisecraft which is going around the table and each of us talks about our 'thorn' for the day and our 'rose' for the day! It's delightful and the kids love it! It also gives your body a chance to register fullness before you've had a chance to overeat. Kids are usually good at eating until they are full, but if they have the habit of eating fast and overeating bring them back to center by slowing yourselves down and they will follow. brown rice - fixed up! We really try to eat brown rice just about every day, and I know that it can get really boring sometimes. I like to turn them into croquettes or a stir-fry on day 2, anything to change it bit from the plain old brown rice. That said, I do think it's important that your kids just get friendly with brown rice, they certainly may complain at first but I promise you the tenth time they won't even think anything of it so just keep it coming! The other day I made this 'souped-up' version of my brown rice and it was so good, the whole family swallowed it up! So here is how it goes, and I think that I will call this Garden Brown Rice! So at the end of cooking the rice I put the beet leaves chopped up. In a separate pan I sauteed the garlic, leeks, carrots and oregano. Just remember if you want to boil your vegetable add it at the end of cooking your brown rice, if you want saute it do it with the garlic and if it's better fresh just throw it in at the end! When the rice was done I just threw it all in there! stirred it up and viola! In the photo I have it served with salmon baked with leeks. If you like to see how the 'other' half lives.... in other words, if you love seeing other people's homes and particular tastes, if you love a mixture of high and low design, complicated or simple interiors, and some nice 'finds'.... well, then, Remodelista is as much for you as it is for me! The creative ladies who come together to share Remodelista's aesthetic have recently revamped their own site. Suffice it to say, the new look is sharper - but the style remains the same.... which is to say, they do all the hard design work for you and all you have to do is wander around and behold the interesting ideas and objects. One of things I like, and adhere to in my own blog, is that Remodelista only shares the things they find interesting or would like to have themselves. There's none of that suspicion that products are being promoted because someones getting a favor. Pure design. And FUN too! I think that the images on Nonchalant Mom are really one of the most important things about my website, it's what makes my website really stand out -- at least that's what everybody tells me! But I really love them too... I take all of the pictures myself and I use my kids because I can bribe them and use "my own language" (to put it in a nice way) with them. I have tried with other kids and it takes too much effort, and my kids are just used to it so it's really easy with them! People sometimes criticize me for using them all the time but they have no idea what it takes to sit down with kids, change outfits and have them smile... my son Sander is a pro, he should be, he's been doing it for 5 years now! The house turns into a mini photoshoot when I do the "flats" because I usually save up collections and then do the all at once, in the summer it's outside on the deck, it's the best sun (or really a slightly cloudy day is best). This year we had sun tarps out on the deck (leftover from our Moroccan party!) and they reflected perfectly for flat images. I try to keep it all fun, fast and easy... but sometimes it turns into a bit of a struggle and then I have to call in my husband who helps out. Most of the time it's a breeze and we all have fun with it. Everyones favorite is the karate pictures (you have never seen the result of these on the website as they are usually running down the hall arms out and leg straight up - Hiay YA!) Most importantly I want you to see the clothing in action, close-up and get an idea of the fit. So they may be boring with the same background all the time but I don't want you to get distracted. I can't imagine what I am going to do when the kids grow up but for now they are my perfect models! We just had a little birthday party here at the house so I thought we would share some of the ideas with you and maybe it can help you to make your kids birthday party, simple, easy and fun with almost no stress! Our theory is that the kids have fun just getting together, having some goodies and yelling and playing! So we don't do a whole lot extra and the party is always fun and exciting and full of what a birthday party should be! - ask everyone to wear your kids favorite color! - we try not to serve too much junk food as the cake is usually a big enough "sugar high" for the kids, so we had little cucumber/carrot sandwiches (just yogurt/creme fresh and cucumbers or carrots, we cut off the crust so that they look special), peanuts, pistachios, corn chips, grapes and that's it! - we splurged on the cake this year but next year it's back to my cake, it's not so hard and much less costly, I like to make a cake in a big square pan and then cut out the number for the birthday, like "4" -- this way you can also control the sugar! - games! - pin the tail on the donkey, water balloon toss, drop the clothes pin into the pitcher, and a piñata! My husband is really good at taking things slowly and really getting the kids into the games. - we just let the opening presents be a free for all... and it usually works out fine. It was a wonderful party for the kids and parents, just a nice laid back day! The most important thing is to have fun and keep the kids moving. good luck!! new york getaway - and work too! My first stop, Makié! Makié began offering a womens collection last Spring 2009, and I assume by how fast you swallowed it up you loved it as much as I do. She brought her amazing level of taste and tailoring to womenswear and we are all the better for it! Not to mention her passion for sticking with classic and high quality fabrics. I ended up hanging out with Makié for a few hours just because we had a lot to talk about, I have known Makié for many years and we share a love for things well made and well-done! So there we sat with glasses of wine, a picnic on the floor of her booth, some cheese and crackers and chatting away just about a bit of everything! At this point I met up with Jann, from Lucky Fish and we cruised the show together. We like many of the same things but I think that she is more daring, plus she lives in NYC so she has a chance to see more than me, so I trust her opinion. There were really amazing colors at nikki b. jewelry - kelly green, persimmon red, and a beautiful blue together with her gold and silver beads... it was all great! And I asked her to make some things just for us... big secret! On Monday, I went over to Erica Tanov to see her epynomous collection and Layla (A new collection that you will see in the store next week! I hope you love her refined take on casual easy clothes for women). When I first opened my store in 2004 I started with a mission to make some of my favorite collections for kids available to everyone; Erica Tanov, Makié, Lucky Fish, and at the time I really wanted to offer Tenant & Son sweaters (but I never found a way to buy them... still looking maybe), among others these were my favorite of favorites! When I am in NYC I never miss a visit to the Erica Tanov store for inspiration (on Elizabeth Street between Prince and Spring). Both Layla and Erica Tanov for Spring 2010 were just outstanding and I hope that I can bring all of these to you! But for now, you have an idea of what you are going to see come Spring 2010 (most things arrrive January - March). ohhh.... The End of Summer. It's been quite comfortable around here in Rhode Island lately. It may be the end of Summer, but it sure feels like it's going out on a good note. In fact, though the kids have started school and time is short these days, there's still some time left for some afternoon 'outside' time. The swimming pool is getting a bit cooler, so that's not as popular. And, the ocean water isn't fairing much better, in the kids opinion. But, get a bit of running water from the well, a few carefully placed rocks, a feather for a flag, and some sticks - you got yourself some afternoon delight. The kids played for almost two hours like this. They'd move around the running water, making dams and then bridges. Then, they'd let the dam burst, start jumping in place and screaming with glee and start the whole process over again. My husband says the singular thing of Summer he will miss is looking out over his studio desk through the window and watching the kids play happily like this. Soon, the leaves that are already starting to change a bit of color will start falling, the weather will get cooler and cooler. But, for now, this could be Summer forever.... and nothing could be more simple. Happy Autumn! 1. almost 50% more protein than cow's milk. 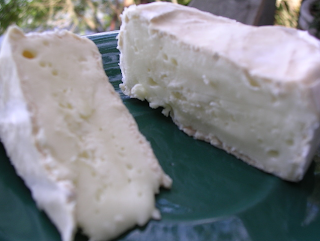 2. it contains twice the calcium and probiotic cultures than cow's milk. 3. provides more in various vitamins. 5. though it contains fat, it's fat is more beneficial than many other milks. 6. much better for your intestines and digestion than cow's milk. 7. because sheep produce a thicker milk, it is not necessary to add stablilizers for yogurt like one must do with cow's milk. 8. easier to find without growth hormones than your regular milk from cows. Apparently, sheep were the first domesticated animal. Cows came later. However, as the cultivation of livestock progressed, it was easier to have the cow. Why? well, it seems the cow produces much more milk on average. A sheep can give just one quart of milk per day (a high-producing breed, 1.5 quarts); a goat, 3 quarts; a cow, 14 quarts. The lower yield is also why goat’s and sheep’s milk products are usually more expensive than their cow’s milk counterparts. Anyway, what's all of this rambling about sheep's milk have to do with Stilton Cheese? Nothing. I just decided to go off on a small tangent. But, if you are a fan of Stilton, you will be surprised and pleased to hear that proof has come that Stilton cheese was first produced in the town of Stilton. I heard today on NPR that a local historian in the English village of Stilton had discovered an early 18th Century letter that reportedly provides a recipe for the making of the cheese. It had been debated that the cheese, mentioned by the writer/traveler Daniel Defoe in 1724 as the 'English Parmesan', might have gotten its name merely because it is where the cheese was sold. It is known that it was produced in larger quantities in the counties of Leiscestershire and Nottinghamshire. However, now, with this discovery, it is proven that Stilton probably did produce Stilton Cheese. 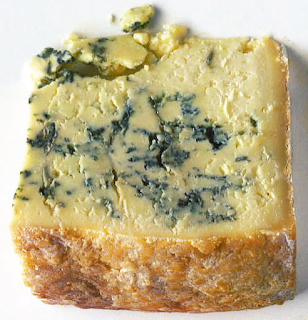 However, before you start rejoicing in the streets, it is worth noting that in the few hundred years since its first production the original Stilton Cheese might have differed from its later blue/green veined counterpart. It seems it started life as a harder, rich, cream-cheese type of product. It is not indicated whether the blue/green veins were available at the earlier time, or if it came later - maybe by accident. And there you go..... a bit of trivia to mark the mid week and first day of Autumn/Fall equinox.....! What better way than the pungent taste of Stilton to mark the end of Summer. This is an easy meal that makes everybody happy! The kids love the shrimp and then by default they just eat everything else... It's very easy and if you have all of the ingredients you can whip it up in no-time! finely slice garlic and depending on how your family likes it... we like tons of garlic so we use almost the whole bulb (and if your family is sick in any way make sure you use lots of garlic in whatever you are cooking! ), turn the heat to medium-low and add the shrimp (I even use frozen, if you just leave it out for an hour or so it's thawed enough) and cook until shrimp is pinkish. Now cut lemon in half and squeeze both halves over the shrimp. to serve, drizzle olive oil on the pasta and then dish up onto plates put arugula on top and then put a large portion of the shrimp and yummy olive oil/lemon/garlic/shallot sauce over the arugula. YUM! It's easy and the whole family loves this one! we serve it with really good french bread to get every last bit off the plate!! 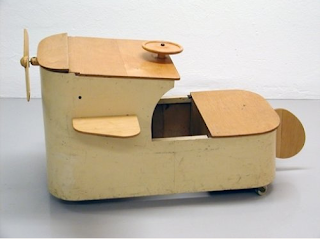 Soooooo enjoying this simple little piece of children's furniture designed in 1950's by the Elbe Factory. Thank you to Rachel at HandMadeCharlotte for pulling this one out of thin air and sharing it with all of us! 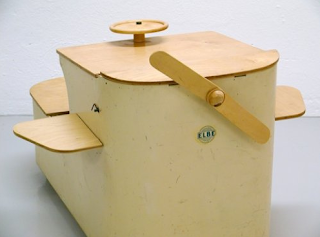 If you'd like to do a little window shopping for some period Scandinavian design and have an hour to spend then go and visit here. Spare the Rod, Spoil the Child ?? Did you know that New Zealanders recently held a referendum and voted overwhelmingly to overturn a law prohibiting parents from hitting children. The government says the law is working and won't honor the vote overturning it. The debate rages as to whether the 2007 law is going to criminalize a whole population of good parents for wanting to discipline their children. I'm not a big fan of spanking children, I just don't agree with it. Anyway, we covered the topic of discipline a little while ago. 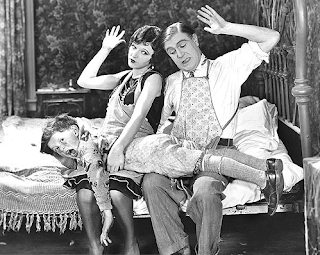 But, I saw this recent study about spanking in the press and thought it interesting enough to share it with you. Have a look at it and tell me what you think? Last weekend, the kids were a little bored. As it happens, I find that if you re-introduce an 'old' toy into the mix, the results can be refreshingly new. So, we pulled out all our Lincoln Logs, Legos, TinkerToys, and wooden blocks, and the kids started building like we had just purchased all of them new! Before long, there was a dock for the pirate ship, a space station, and a mountain gondola (my husband helped rig it up for them to transport people back and forth across the room). Hours of fun. Go figure. I was reminded how fun it can be to watch the kids work away like that, totally engrossed. It's why I found the story from Blair at WiseCraft so funny. 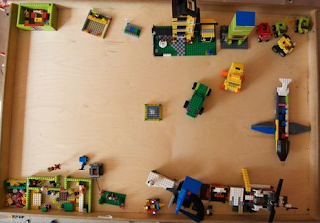 Her kids spent the day recently obsessively building a Lego city from the ground up, as she tells it. I didn't take pics of our kids creation (you might not have been able to tell what half the stuff they built was anyways) that day, but I've added some of Blair's pics of her children's city. My husband says it reminds him of when he and his brother and sisters would build a great city out of overturned boxes and Hot Wheel tracks. There's all sorts of fun things you can do once you've got some building going on. 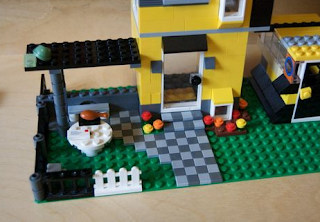 Blair's kid's Lego City !! Which reminds me, there's one adult who is taking the building thing to the max. 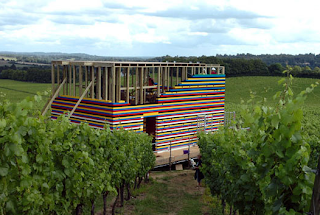 In Surrey, England there is a man by the name of James May (A host of a show on the BBC) who has been building a life size home from Lego blocks. 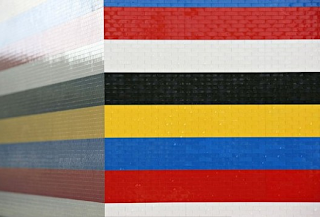 With the help of thousands of enthusiasts building brick by brick one little Lego at a time (millions of the things), the home was started a month or so ago. It's supposed to be finished right about now but I couldn't find any news about it. Mr May has every intention of living in the house for a brief period and this is probably why the local authority became curious and took a closer look. Apparently, though, the house is still being built. I just love the color of the house. I also guess you won't have to worry about mold. 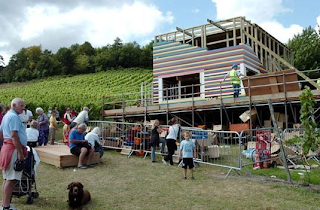 Whatever the scale - happy building to both kids and adults! 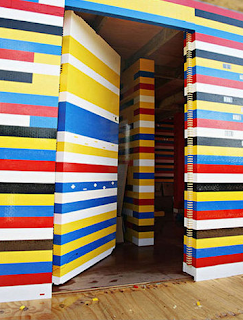 Life Size Lego House !! Wee See: to the rescue !! The return to school routine is not always easy after a long rest of the mind over Summer. Our kids have been doing fairly well, but I've noticed a bit of edge by the afternoon that I can only suspect has to do with a full days concentration being required at school. So, somewhere between quiet time and full on play time I have let the kids 'chill' out for a bit in front of Wee See. Those of you who have already rushed the gates and got your copy, or copies, know how happy a thing it is. Your children get to watch TV, but they are doing so with the parental knowledge that what they are watching is quite good for their mind and pretty unique in terms of children's entertainment .... these DVD's are third-eye kind of energy, if you know what I mean! I tried the harmless experiment a few times since school began and it's worked like a charm. The kids weren't so edgy or grumpy and were actually entranced by their own imaginations, rather than someone else - and it's just plain nice to see them watch something that hasn't got a lot of crashing sounds and quick edits. And, the soundtrack is perfect for a calming effect throughout the house. FANTASTIC !! If you haven't purchased your copies yet, I still have some left. You really should check it out - find the DVD's on my website and simply click on the bottom of each collection's box to bring up the shopping cart. Trust me when I tell you that rumor has it that our friends at Wee See are going to be featured in October's issue of Cookie Magazine (coming to you very soon) and you know what that's going to do to supplies. Come on in and get yours now! I'd say even your littlest ones will love it. Wee See is a piece of art in your own home! wee see - collection one from Rolyn Barthelman on Vimeo. wee see - collection two from Rolyn Barthelman on Vimeo. Our friends over at Change.org have sent us notice that the Department of Labor has finally, with the gentle pressuring of Change.org readers and NGO's like Polaris Project and the International Labor Rights Forum, published a 194 page report on child and forced labor produced items from around the world. It is not a highly detailed report listing exact items or those companies involved in the production, but it is a start in the right direction. This kind of reporting was government mandated in 2005 but has been dragging along until now. So, some thanks are due to the DOL and those groups that helped 'persuade' them. You can read the story at Change.org and learn the list of items that are branded as such, and a list of the most troubling countries (none of which might surprise you). There is also a comments section where you can leave your thoughts and read some other interesting ones. My favorite one is from a woman who thinks that child labor might not be such a bad thing, and indeed, might be necessary for children in poor countries to help their families (unfortunately true in many cases). This is just plain bad. 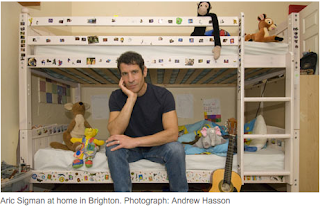 What's worse is that some go on to think that children in the USA should work too. Personally, I think it's a long way from being a child laborer to having a part time job for a bit of spending money and to learn a work ethic. Our kids have simple tasks they must do for pocket money each week. Surely, I wouldn't consider this to be child labor though. 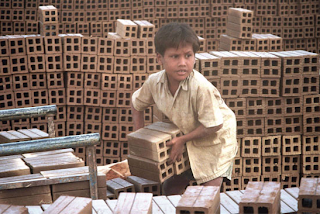 It's a bad thing to consider that thousands of young kids are forced into hard labor and there are many ideas to help support keeping them from having to do so (like govt programs that pay children to go to school in poorer countries). Equally, it is important that we learn as much as we can where our daily products are made, how they are made, and by whom. As consumers, the more we know the better we are. And, it helps us to remind those people who allow this kind of thing (companies and governments alike) to continue, just how important it is for all our societies to make this stop. Children deserve a fair and clear future. A Farmer's Market at the White House? 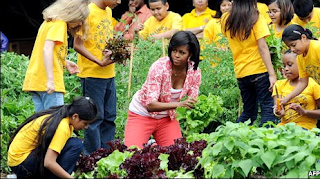 Well, on the heels of my previous post about my own humble garden comes the news that the White House is reportedly (particularly Michele Obama) behind the idea of allowing a weekly farmer's market adjacent to the White House property. Apparently it is being encouraged by Mrs Obama as part of her ongoing campaign to raise attention about the average Nutrition and Diet in this country. What a GREAT message to send out! More fresh veggies and fruits in our diets ..... now who would want to dispute that! The market is supposed to feature 18 local farmer/producers selling fruits and veggies, naturally raised meats, cheese, eggs, and baked items. 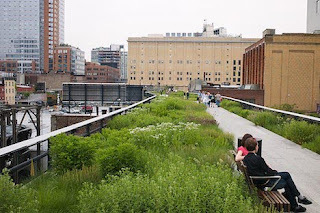 No one knows for sure if the White House garden will be involved or not, but it has been suggested that the White House assisted in promoting the planning permission to allow it. It appears it will only show up on a weekly basis from Mid September to end of October for now. You can read more about it at the BBC here, or at the New York Times here, or at the Guardian Newspaper here. I thought it was time to give you an update on the garden... it went a little wild while we were gone on our road trip. I came home to kale leaves the size of Texas! unfortunately since I wasn't home to keep track of things they were over run with bugs, so off they all went! BUT I planted more... I heard that kale can almost grow in the winter so I am going to test out that theory! My carrots (above) grew like mutants! all of them had three or four legs, not one of my carrots looked like a real carrot... but they TASTED good! The kids loved them with a dip made of plain yogurt and a little creamy salad dressing mixed together (mostly yogurt). We all got a kick out of pulling them out of the ground to find these huge jumbles of carrots! I think that the leeks were the best, for some reason about 50% of my garden was leeks.. oops! But it's great, they are the perfect addition to just about anything, so they really came in handy. Next week I will pull up my beets and let you know what happened, but they look like they are the size of grapefruits! The "compost tomatoes", if you remember I just used my compost soil (we don't take the seeds out of anything) in a few areas and the result were some terrific tomato plants and two squash plants (but they didn't make it.. eaten by bugs). We have a really nice variety of tomatoes and most of all I love their scent! Herbs were my last planting and I just finished off my flower pots with herbs, I would say that the most handy was parsley, it's so nutritious and I added it to just about everything I cooked, the kids really loved it (or at least no complaints) and I really feel like it adds to each meal! Having the herbs on hand is great, you can always make in impromptu meal using the recipes I have given you in previous posts for pasta and potato salad. I feel much more comfortable about doing a larger garden next year, it didn't take much work after I put it in and I did realize that you continue to plant throughout the summer. So once I took something out I fixed up the soil by adding some new soil and then planted some more seeds... there is really no need for a very large garden (unless you are a huge fan of squash like I am, I really missed not being able to grow them this year and I can't wait to try again next year.. I even found the perfect spot!). For our small family of four, the size of our garden worked perfectly (only about 48 square feet). I hope that this inspires you to make your own garden next year, I am by no means a green thumb and it was very easy and fun to take care of and the kids really loved helping out! When I was writing the last story about drinking water I realized that I wanted to better explain the issues with SIGG. A story broke recently that there was traces of BPA in SIGG water bottles made before August 2008 (see below for all of the links). It is in the epoxy that was used in the lining of their bottles, which makes me really wonder about all of those bottles that are made by various companies in china and other places... So as always its important to buy from a brand that you have checked out or that specifically produces BPA free containers. There are quite a few BPA free bottles out there, we use Nalgene in our house. There has been a lot of backlash and SIGG is now willing to replace your old water bottle with a new one. A lot of people are very angry to say the least and it's all very heated. But I think that Treehugger does a good job of just keeping the facts straight and letting people know what to do now. click here to find out how to replace your SIGG water bottle. When we decided to write this post it came as a strange surprise to see how many women we knew come forward with their own memories of being a Camp Fire Girl. In fact, to any devotee of Camp Fire Girls (or its younger group called Blue Birds), the biggest mistake you can make is to equate the organization with the now better known Girl Scouts (or Brownies). It is a mistake that is a bit unfair considering Camp Fire actually came before Girl Scouts. Actually, it was born from the fact that girls at the time had no organization comparable to the Boy Scouts. So, in 1910, in the state of Vermont, Camp Fire Girls was established. We felt it was important, on the eve of Camp Fire's centenary celebration, to share with you something that was very important to many young girls during an equally influential part of their lives. An organization that has been handed down from mother to daughter over many decades (boys were finally encouraged to join when Camp Fire became co-ed in 1975). Leslie H, our friend in Long Beach, CA, has shared with us many of her own fond memories of being a Blue Bird first, and then achieving the level of a Camp Fire Girl. She told us a story of how her mother was a group leader, the Camp Fire meetings held at her house, the summers spent at camp and the 'ceremonials' where the girls would dress up in American Indian influenced outfits and receive new honors. She said she was excited to fly up through the various levels. Both her parents organized meetings and the girls would learn macrame, sewing, beading and would produce every kind of craft imaginable. 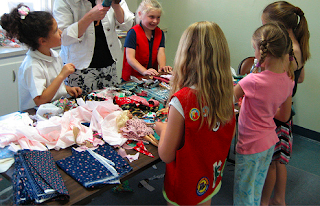 A Camp Fire group is usually 10 to 15 girls, meets weekly to do projects which will earn each girl a patch and/or bead. There is still a curriculum for leaders but Camp Fire is set up to be fairly flexible when it comes to the weekly activities. Leslie tells us she was in CFG for 10 years and enjoyed every minute. The Girls in Leslie's group make clothes for their barbies! The CFG started with their earliest inspirational word/motto created by co-founder Charlotte Gulick in 1910, which was (and still apparently is) used as a greeting among members and as a sort of password. WoHeLo stands for Work, Health, and Love. The meaning was important in introducing the progressive programs designed to encourage strength, compassion, and wisdom in the young girls and was a strong basis for allowing the girls to recognize the importance of self respect, service to their community and country, and openness to diversity in others and the environment as a whole. 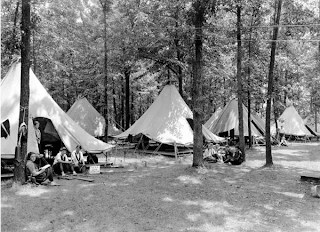 Through the decades the organization fostered programs encouraging the girls to helpful action, starting with World War I. 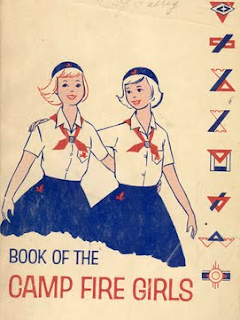 The vintage Camp Fire books describe a Camp Fire girl as someone with high ideals, a quiet pride in being a girl, deep love for her country, a good friend, can do work skillfully and takes pleasure in hard work, has interests and hobbies enjoyed with others and alone, has good health and good habits and a love for the outdoors. 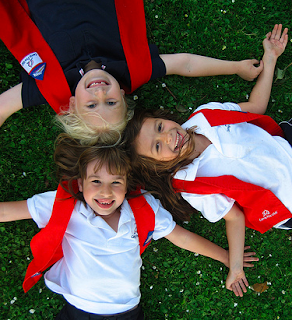 Today, the numbers of members has sadly diminished with the rise of many other activities for girls and boys - as well as the better known Boy Scouts fostering their own sister organizations like Brownies and Girl Scouts. In fact, Leslie told us that one of the hardest things is to find a mother (or father) willing to commit the time to engage in forming and maintaining a group. This is a modern problem considering that many families now have both parents working full time - which is one significant change from 100 years ago. In fact, it is the very thing she struggled to come to terms with a few years ago when her own daughter came of age. Leslie has found a way to balance her own busy schedule and thinks that other parents could do it too. As the Camp Fire organization enters into its 100 year celebration in 2010, we are told that the organization as a whole has steadily declined in interest for some years now. Some fear that it will one day soon just disappear as anything viable. But, we remain optimistic that it can find a new meaning in the coming years and once again inspire. If you'd like further information about the organization you can go to the Camp Fire website. And, if you'd like to get some insight into a particular group Leslie has agreed to share with us her blog called 'From Blue Birds to Bear Cubs'. It goes without saying that if this story triggers your own memories of being a Camp Fire Girl we'd love for you to share them with us. It really seems to have been a special time for many mothers and daughters through the years. And, that alone, is worth celebrating!!! WoHeLo......! What's Up With FIjI Water? Better yet, What's Up With Plastic Water Bottles? The troubling story behind the popular FIJI water was first brought to our attention recently by a note from our friend Nicole J. 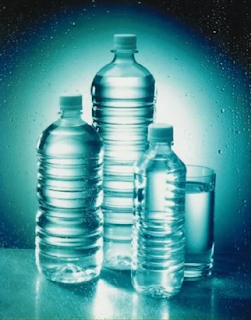 After reading the story that she shared with us on AOL's Daily Finance it reminded us that the biggest trouble of all is that we still insist on sporting plastic bottled water whenever we find ourselves out and about. It's not even the unique story of FIJI, which shouldn't surprise us, but the overall effect that all this use of plastic water bottles is having on our environment in the long term. We've had some heated arguments in our house about the best way to circumvent the 'need' for using the disposable bottle water like this. First of all, I think that it's really important for the whole family to drink water, and to stay away from fruit juices. In my opinion the best water is from your tap if you use a reverse osmosis water filter system. If you haven't 'tasted' this kind of water yet try it and you will be amazed. This is quite an investment, but if you take a simple water test on your tap water you can see how yours measures up you can make the decision on how to filter your tap water. Secondly, what ever happened to a plain glass of water! Why do people find the need to constantly tote around a bottle of water? When you take the kids to the park fill your SIGG (BPA-free see this story from Treehugger on how to tell if yours is BPA free or not) or Nalgene BPA free water bottle and tote it along with you! Easy and Cheap! I see people drinking these giant containers of liquid (usually these are overweight people in the first place) which is far to much liquid for your liver and kidneys to process, it totally overworks them and just leaves you sweating. Remember it's just 8 ounces a day. On a recent visit to the Kit+Lili offices in Brooklyn, NY I noticed that they had a spring water cooler with a GLASS bottle for the whole office! I thought this was great! They said it costs more but still not that much more and you can feel better about it. Check with your water supply company, if they don't have glass they probably have BPA free containers at least. And then there is the conversation about FIJI-the company... giving very little back to it's source, Fiji! Well that's enough for me to put a ban on FIJI all together! This may help you take your first step to being a plastic bottle free water drinker! HA! Our 4 year old wants to draw well. She sees our 7 year old son do it, and she wants the same results. She's not bad at the coloring books - pretty good at staying in the lines and some interesting color choices. But, she's still a bit frustrated with the free style stuff. So, this evening I started floating to some of my favorite blogs for some fun and relaxation and saw this great stamp set recommended by Rachel at handmade charlotte. 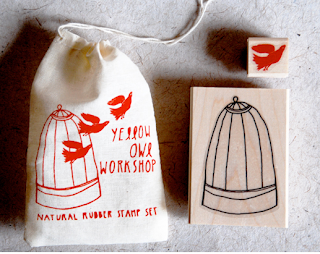 The various stamp sets on offer at The Yellow Owl Workshop are not only using natural rubber and reclaimed wood, they go a long way in bridging the divide between being able to draw what you want freely and just plain not. 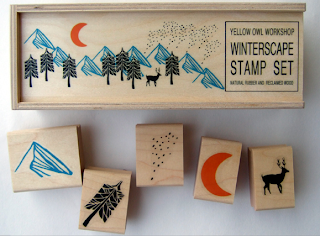 I think my daughter will love the fact that she can create a story using the stamps. She can then feel free to fill in the 'blanks' using her own limited drawing skills. Now, she'll be able to draw without having to worry about some of the technicalities.... what a great encouragement. And, oh yes, as Rachel suggests, the stamps alone are impressive.... and, in my daughter's case, they'll go a long way in encouragement! I'm going to give it a try....no? I'm sure they will be fun. There's a CityScape, LandScape, WinterScape, and SeaScape. Perhaps a mix and match might be fun too. Whatever you decide, the results look to be beautiful. Check'em out! until now I have been gun-shy about dipping my toe into politics, but today on a friends facebook page I found this wonderful little cartoon. I thought was a nice way to explain the whole health care issue. I will say flat out I am not trying to offend anyone, step on any toes, or tell anyone how to run the country, but I will say this, I can't afford health care and I think it's ridiculous that I can't. I hope that you enjoy this video as much as I did... and I hope it helps spread the word in a peaceful way that our health care system in this country needs to change. Spirulina contains Gamma-Linoleic Acid (GLA) responsible for reducing heart attacks, improving circulation and relieving arthritis pain. Spirulina contains digestive enzymes and pigments of chlorophyll and phycocyanin which are beneficial to the liver. Spirulina promotes weight loss and many positive effects on the mind, such as improved alertness! Spirulina is the highest source of Vitamin B-12 which is essential for healthy nerves and tissue. 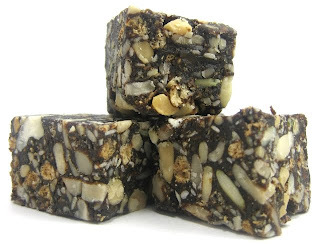 These squares have carob, spirulina (usually about 500mg per square), brown rice, papaya juice, honey and rice bran as their main ingredients. You can find them in your local co-op if it offers bulk food and also at Whole Foods (in the bulk section). I think that they are also good snacks for women too as they have lots of fiber. I also noticed that there is a 'blonde' version of these but they don't have the spirulina but they do have brown rice, etc.. I think they are a great snack too. I love the fact that they are comtact and tiny and not a big 'breakfast bar' kind of thing! Let us know if you have sucess of failure with these! you can also purchase online here and get more information. wizard of oz in the theater! It's Back to School ! !